The Romanian capital, Bucharest is home to a vast public transport network. The city centre was largely rebuilt under the Communist regime, resulting in some grandiose buildings as well as usual 1960’s architecture. The central area is surrounded by vast suburbs and new commercial developments. This provides the backdrop for the comprehensive transport system operated by RATB which our cameras follow. RATB run a large fleet of trams that include the Tatra T4 as well as many home built articulated cars of which some have been recently rebuilt. The trolleybuses consist of a large fleet of Ikarus Astra 415T and the very latest Irisbus Astra vehicles. Buses consist of older Rocar and new Mercedes Citaros. We begin with a look at tram and trolleybus operations to the west of the city centre with locations at Calea Plevnei, Gara De Nord and Timisoara Bulevardul where the remaining Tatra T4 cars operate in tandem on routes 8, 25 and 47. We also sample a short ride on a Tatra to Huwe Danny Piata. In the city centre our cameras focus on trolleybuses at Str. G. Polizu before moving to Piata Victoriei for more tram action featuring many of the ‘Bucharesti’ rebuilds before concluding with a ride on board ‘Bucharesti’ 305. Continuing our coverage of the city centre we visit Universitatii Piatia which is dominated by old and new trolleybuses on cross city services. Bucharest is a very busy city with plenty of action for you to enjoy as we concentrate filming at the busy northern intersection at Str. Turda during the evening rush hour. Here we see trams on routes, 20, 24, 42 and 41, the latter operated by the latest additions to the fleet. 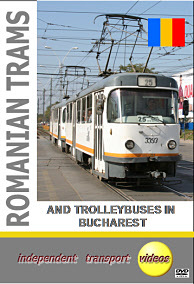 So join us for our third programme in this series featuring Romanian tram and trolleybus systems.